On this page you will find the Lenart Chess Club Practice and Tournament schedule, along with weekly announcements and updates. This year CPS is offering several additional tournaments as part of the CPS Academic Chess season. Elementary schools are required to participate in 2 Academic Chess Sanctioned tournaments to qualify for the playoffs in March. The January 12th Kings & Queens tournament and the February 2nd Greater Chicago tournament are the two remaining Academic Chess tournaments of the season. Both tournaments are free to play in, lunch will be provided to the students and coaches. The Kings & Queens tournament is a team event and Lenart can have up to 3 teams of 5 students entered to participate. 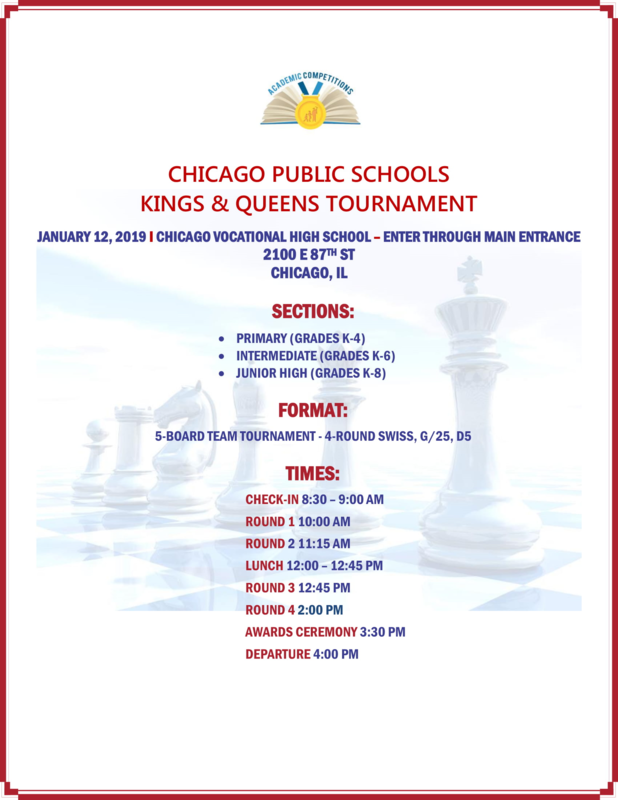 If your child is available and would like to participate in the Kings & Queens Team Tournament on January 12th at Chicago Vocational Academy, please fill out this form by January 6th, 2019. The Greater Chicago tournament is an individual tournament with team awards. If your child is available and would like to participate in the Greater Chicago tournament on February 2nd at McCormick Place, please fill out this form by January 20th, 2019. We have an actual chess coach lined up for our Lenart Chess Club students! Edwin Walker is very knowledgeable and experienced chess player and coach. He will be seeing students for 3 Thursdays from 3-4pm for just $25 a student! Edwin works with other CPS schools to build and strengthen their Chess Team. He does not keep any of the money for himself, he donates it to chess teams that are in need of basic materials like boards, pieces, and clocks. The cost is $25/student for 3 sessions. Even though this is a group coaching sessions, all levels will benefit from his lessons! He has experience with coaching groups of different ability. He stated that he would start with whole group instruction about the strategy he’s teaching that day, then students will have specific tasks to work on based on their level/ability. Session 1 will be Thursday, December 20th! Please email Ms. Villwock for an electronic version of the permission slip.